In August this year I lead back-to-back expeditions for photographers in the Arctic to Greenland, Svalbard and Iceland with my good friends Daniel Bergmann and Peter Eastway. Daniel worked with me as a co-photography guide on the first trip and AIPP Grand Master of Photography Peter Eastway joined me on the second return journey. 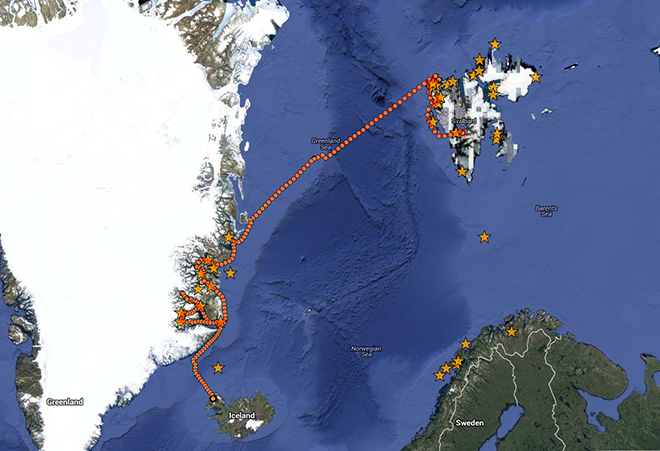 The first expedition departed from Longyearbyen in Svalbard early in August and sailed up the coast of Svalbard before crossing the Greenland Sea (Arctic ocean) to Greenland. We then sailed down the east coast of Greenland exploring many of the incredible fjords (including the breathtaking Scoresby Sund and Kaiser Franz Josef fjords) before crossing the Denmark Strait and docking in Ísafjörður in the north of Iceland. The second expedition departed from Ísafjörður, crossed the Denmark Strait to Greenland where we sailed up the coast stopping in many of the fjords before sailing back across to Svalbard and docking in Longyearbyen. As these two expeditions were very similar in their planned itinerary (except in reverse) I am combining my trip reports into this one post. As is always the case however, no two expeditions are ever the same and each had its own share of amazing experiences, weather, wildlife and surprises. These were truly extraordinary expeditions that at our most northerly position saw us only approximately 600 miles from the North Pole skirting the edge of the Arctic pack ice. For those of you unfamiliar with this part of the world Svalbard is serious Polar Bear country and we were fortunate to have a couple of good bear encounters on our first expedition – including a mother and cub that we stumbled upon feeding on a reindeer kill very early in our expedition. Polar Bear do not normally hunt reindeer so it is likely the mother simply stumbled upon an already dead animal. Nevertheless it made for some fabulous photography and a unique wildlife encounter. 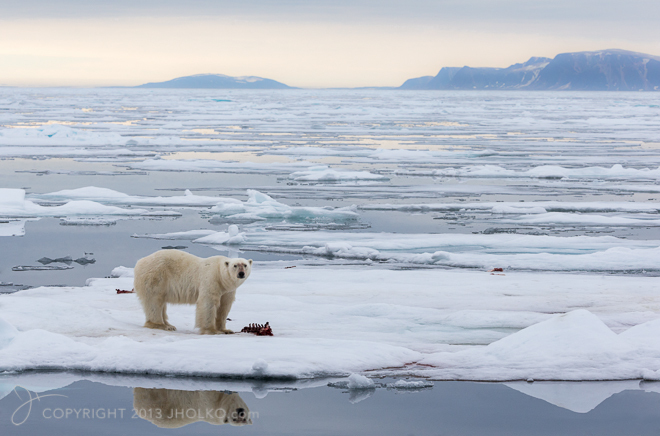 We also encountered a couple of bears on the pack ice near Shannon Island. Although this encounter was brief it nevertheless resulted in some fabulous photographs. The route we travelled was similar on both trips with some variation in heading and landing locations. During our time onboard our expedition ship ‘Polar Pioneer’ we made daily shore landings at many places on the Greenland and Svalbard coasts. In many cases we landed twice per day or depending on our location we also cruised in zodiacs through several iceberg graveyards including the spectacular Red Island and Bear Islands areas. Wherever possible we attempted to land in locations we new would provide outstanding opportunities for wildlife and landscape photography. Many of these locations provided us with wildlife experiences as well as an opportunity to stretch our legs from ship board life. These were shared expeditions with kayakers and in many instances the kayakers chose to paddle instead of land. Just some of the locations we landed or zodiac cruised included included Kap Stewart, Red Island, Hare fjord, Nordbugt, Eskimobugten, Syd Kap, Bear Islands, Gateau Point, Kong Oscar Fjord, Nanortalik, Blomsterbukten, Smeerenburg, Fugelfjorden and Lilliehöökbreen. Each of these locations provided us with a unique experience and each offered something different in the way of photographic possibilities. One of the more fascinating locations we visited was the inuit village of Ittoqqortoormiit. Ittoqqortoormiit is located on Liverpool Land, near the mouth of the northern shore of the Kangertittivaq fjord, which empties into the Greenland Sea. This small village of only 450 native Inuit is a fascinating location that gives significant insight into life in Greenland – a harsh existence. 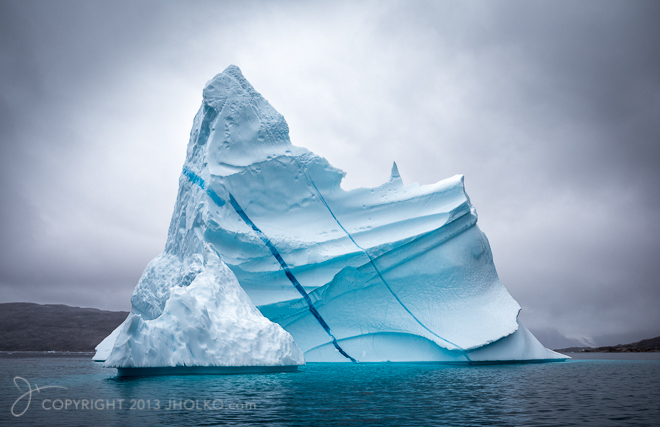 We also cruised into Scoresby Sund and Kaiser Frans Josef fjords where we discovered incredible landscapes and giant castellated icebergs – several of which were easily the size of large football fields in size and half a dozen stories high. Both these giant fjords personally rate as the highlights of these expeditions. The geology and icebergs in this part of Greenland are breathtaking and the landscape unique in my experience. The opportunities for photography are limitless and just about everywhere you look there are images just waiting to be made. Of course, the entire landscape is bathed in the glow of the midnight sun so there are quite literally hours of golden light for photography. 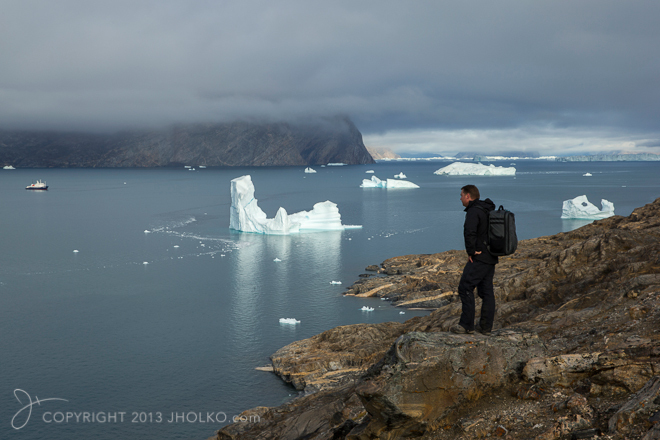 The real highlight of both expeditions in my experience is the fjords of Greenland. The geology in Greenland is truly incredible and nothing short of miraculous. 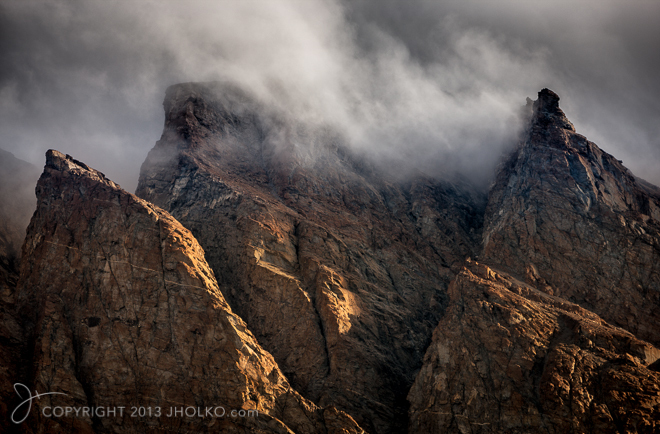 Contrary to many peoples preconceptions the coastline of Greenland is incredibly rocky and desert like. No where else in the world have I ever witnessed such incredible rock formations and geology as that found on the east coast of greenland – It is both surreal and otherworldly. There were several instances I can recall where we literally put down our cameras and simply marvelled at the rock formations. Of course, there are incredible glaciers and glacial tongues that snake down to the ocean between the mountains and giant icebergs that drift slowly down the fjords on their journey to the ocean, but it is the geology of the land that I personally find truly remarkable. Almost everywhere you look there are signs of incredible upheaval and geological activity. It is no wonder that geologists flock to Greenland and regard its formations as one of the holy grails of geological study. We experienced a wide range of wildlife during our expeditions including Polar Bears (on the first trip), Musk Ox, Walrus, Reindeer, Arctic Hares, Bearded, Ringed and Harp seals and a plethora of sea birds including Arctic Terns, Kittiwakes, Fulmars, Skuas (including great, pomaraine and long tailed varieties), Glaucous Gulls, Guillemots and the rare and angelic aptly named Ivory Gull. One of the favourite pastimes for many on board was to stand on the bow or stern photographing the many sea birds as they followed us on our journey. We did search for both Gyrfalcon and Snowy Owls in two locations where they are known to nest but were unable to locate them (although we found recent evidence of GyrFalcon activity). I have yet to see a Gyrfalcon in the wild and eagerly await the day I am fortunate to site this rare bird of prey. We were also fortunate to encounter a huge pod of Humpback whales on our first expedition as well as a Blue whale and young Calf which followed us for an hour or so under the Midnight Sun. I was also fortunate on the first expedition to very briefly site a Beluga Whale and calf near the carving face of Svalbard’s largest glacier. The sighting was brief however and the whale and calf disappeared before I could even raise my camera to my eye. 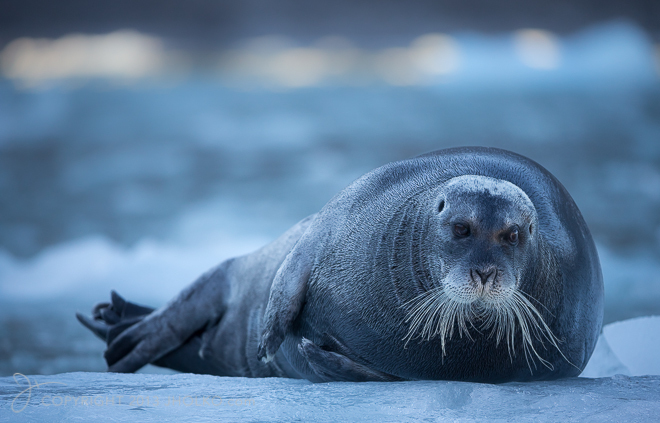 Long lenses for wildlife photography in the arctic are really a must. Unlike Antarctica, much of the wildlife in the Arctic is found at a distance and can be quite skittish. I took Canon’s new 200-400mm F4L IS lens with inbuilt 1.4 Teleconverter for these back-to-back trips and found even with the 1.4 TC engaged that I often wanted more reach on my full frame 1DX camera. I will likely also take a 600mm F4L IS lens with me next year. One of the more obscure attractions to a Polar Expedition is the optional and rather intimidating Polar Plunge for those who are feeling brave. It takes some conviction (one could argue lack of brain power) to jump into ice filled 3º celsius Arctic waters in the name of joining an elite society of ‘polar plungers’. I admit, I bailed on the opportunity to join this club on the first expedition this year, but had my arm twisted on the second trip and was subsequently convinced that it was a good idea to jump off the fourth deck of Polar Pioneer for the video camera. For posterity here it is – shot on the RED Epic Cinema Camera at 350 frames per second. And yes, that water was every bit as cold as it looks. Just click on the image to view the video on Vimeo. 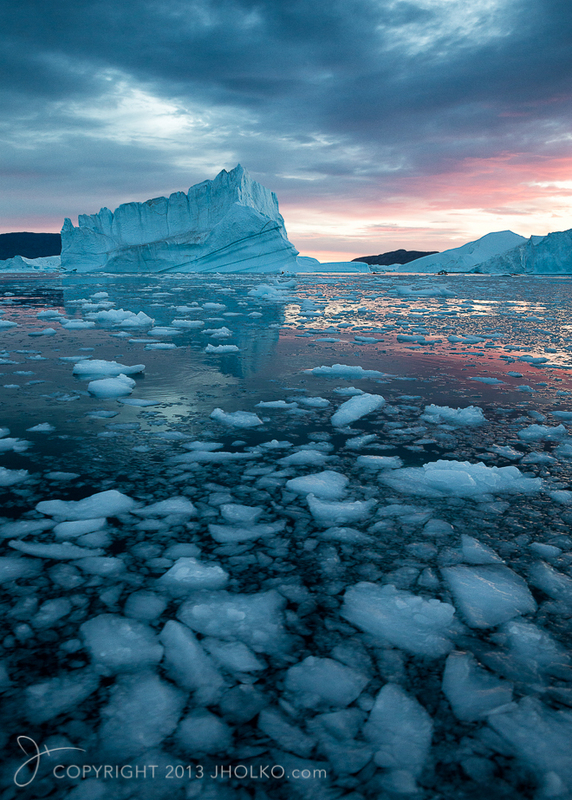 One of the real treats of a photography trip to Greenland is a dawn cruise at an area known as Red Island – An iceberg graveyard where icebergs of all shapes and sizes collect and slowly melt in the Arctic summer. Cruising amongst these amazing icebergs as the Arctic sun slowly rises and throws its color across the ice is an incredible experience. 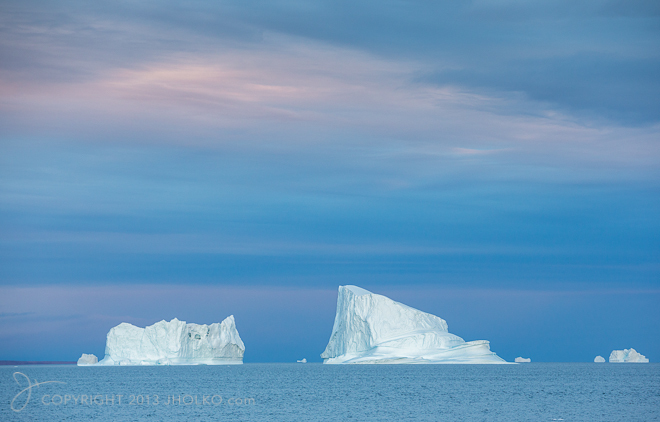 Were were fortunate on both expeditions to encounter some really beautiful icebergs with outstanding light. As you may gather from its name, the area is home to a large island of red rock whose colour defies something you would think Mother Nature capable of creating. In terms of temperature during the expeditions we never really encountered any seriously cold weather with most days averaging a few degrees above zero. It did occasionally get chilly when cruising around the calving faces of many of the glaciers in zodiacs when the catabatic winds were bringing cold air down off the ice. Of course, the wonderful thing about zodiac cruising and photography from zodiacs is that we can return to the ship at any time required. We did have two days in Greenland where the mercury climbed to ten degrees which gave us pause to strip off a few layers as we hiked up the side of a mountain for a view across one of the many fjords. We really only experienced a couple of days of dubious weather throughout both expeditions and in both cases we were fortunate to be at sea in either the Denmark Strait or crossing between Greenland and Svalbard. A few souls did succumb to seas sickness during these crossings but on the whole most of us rode out the swells with our dignity in tact. Greenland and Svalbard are fascinating locations to visit and photograph and we were fortunate to encounter and experience some extraordinary sites – perhaps the most spectacular of which was a huge iceberg collapse on the second expedition which was captured on film by many of the expedition participants. During our time in the Arctic we also witnessed several huge glacial calvings whilst photographing from zodiac and a plethora of incredible icebergs. Many of the larger icebergs we encountered contained water ice fractures – crevices that have subsequently filled with water and re-frozen. These lines are an iridescent blue and run like lightning bolts through the ice. This is a phenomena I have not experienced before outside of the Arctic and I will look closely this November when I am in Antarctica to see if I can find any examples in the southern polar region. A word on preconceptions: Probably no where else that I have travelled have I held such strong preconceptions of what Greenland would be like and never before have those preconceptions been so brutally shattered by such an incredibly juxtaposed reality. Greenland is absolutely nothing like you would most likely imagine. It is a rocky barren land formed from massive geological upheaval and although it has an incredible ice cap across much of its land mass its coasts are incredibly desert like and devoid of ice and snow during the Arctic summer. 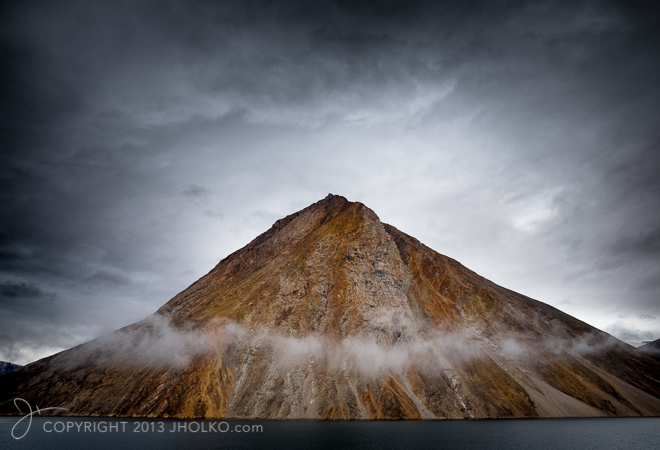 The fjords are lined and guarded by precipitous peaks of orange and yellow rock that thrust upward from the sea in all manner of twisted and tortured formations. Glacial tongues sporadically snake down between these peaks – many of which are showing significant signs of retreat. 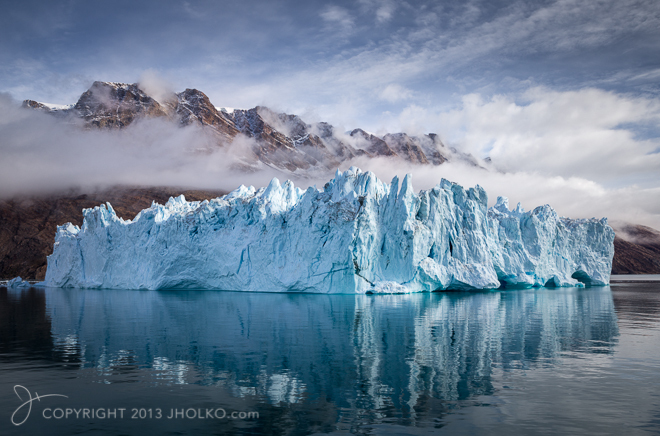 Greenland is a country of stark and beautiful desolation, of jagged peaks and hidden fjords. Perhaps no where else have I sensed so strongly the wildlife’s struggle for survival against such a hostile environment. Yet, there is a beauty that is near impossible to describe. After all, how does one describe something when even the best superlatives you can think of — words like magnificent, incredible, stupendous, other-worldly — seem inadequate? During these two expeditions I shot over ten thousand images and have only just started the long editing and processing process. Given my current travel schedule it may well be many months before I get an opportunity to really mine all the potential from these two expeditions. Many of the participants have already edited and processed files from the trip and sent me examples of images they were able to capture. 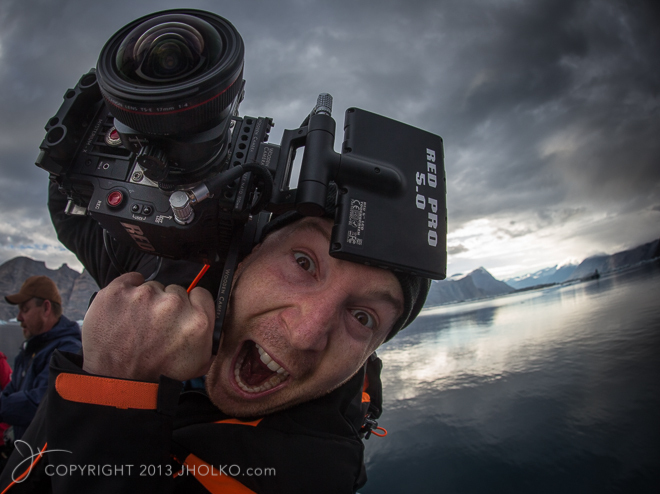 I am particularly excited about the video I will be releasing later this year from the 2nd expedition. In case you missed my earlier post I enlisted Abraham Joffe and his production company Untitled Film Works to accompany me on the second expedition to film and produce a short movie of what it is like to be on a polar photography expedition. During our time in the Arctic we were cable to capture some incredible footage of massive iceberg collapses, glacial carvings, wildlife and much more. The majority of the video we shot was captured on a RED Epic Camera in 5k resolution. The RED Epic is the very same camera Hollywood uses to film the majority of its major film productions. Shooting with a RED Epic enabled us to capture incredible resolution and extremely high frame rates. This proved invaluable when shooting glacial carvings and iceberg collapses. 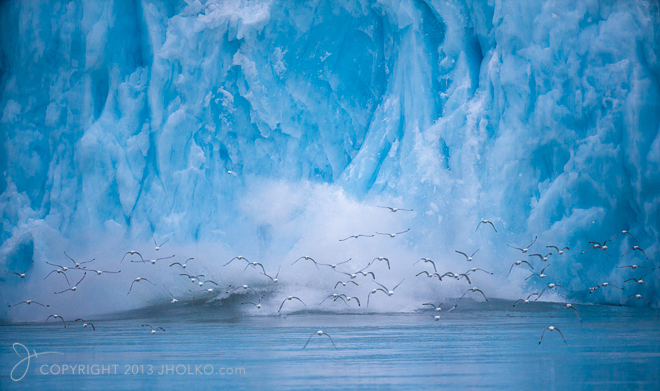 You can see a number of photographs I made during these expeditions on my website at www.jholko.com in both the Svalbard and Greenland Portfolios.